Sydney-based AALER Engineering has officially launched a Kickstarter campaign for its new development board, MicroLink. 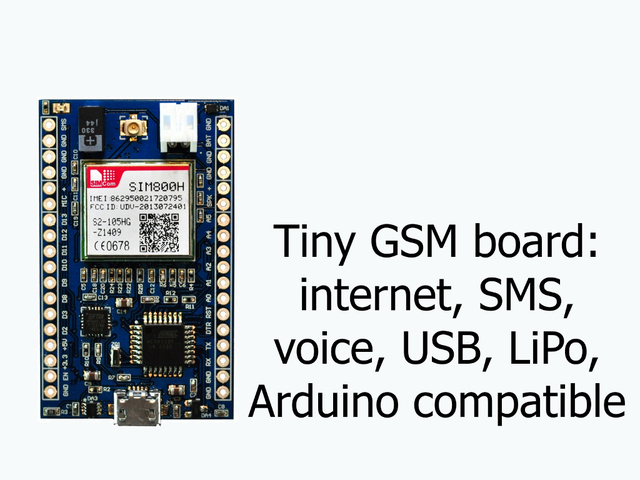 Equipped with an Atmel ATmega328 MCU, the Arduino-compatible board is capable of automation, alerts, cellular data, phone calls, SMS messages and more. The MicroLink is more than just a tiny Arduino with GSM; in fact, its on-board USB and battery charging capabilities provide Makers with the capacity to implement professional quality wireless remote-monitoring and control. An ATmega328 allows for constant control, while a SIM800H quad band GSM module makes communication with wireless devices simple. Measuring just 50x32mm, there truly isn’t a place where the MicroLink couldn’t fit! One of the most unique features of the MicroLink is that it comes ready to use out of the box with a true plug-and-play dynamic. “Each MicroLink comes with an SMS sketch pre-loaded – so you get the capacity to do remote monitoring and remote control, using SMS text messages, out of the box, a company rep explains on the Kickstarter page. The simplicity of GSM communications offers an extremely valuable and reliable rapid-prototyping tool for an endless number of projects. Indeed, the uses for this device are really only limited by your imagination. Some suggestions from AALER include sound or motion detectors, an SMS car alarm, a homemade phone, or even a fall alert system for an elderly individual. Each of these projects, plus countless others, are made possible due to the unique nature of the MicroLink build components. There are two versions of the MicroLink currently in the development pipeline: Standard and Extra Flash. The Extra Flash model boasts extra memory – an additional 4 MB 104MHZ SPI FLASH chip, which is attached to the back. The extra chip enables extra data-logging, and over-the-air wireless reprogramming. According to its creators, the ability to upload programs over-the-air will be particularly useful in circumstances where continuous physical access is problematic, such as deployed in other dwellings, industrial installations and remote locations, as well as embedded within toys, appliances and other devices. Moreover, the Extra Flash version sleeps at 11 µA, while the Standard sleeps at a very low 6 µA. The team notes that a standard implementation that sends data every 48 hours could last more than year on a coin-cell battery. “The initial design originated from a genuine need — the key attributes of very-small size, GSM, ultra-low power consumption and USB give an incredibly useful, versatile and valuable tool that can be used for a broad range of tasks,” its team adds. Currently seeking $40,000, the AALER Engineering is already a quarter of the way to achieving its goal. The team hopes to have the first batch of MicroLinks shipped to its backers by this Christmas. This entry was posted in Arduino-Compatible, Maker Movement and tagged AALER Engineering, Arduin-Compatible, Arduino, ATmega328, GSM, Kickstarter, MicroLink on October 13, 2014 by The Atmel Team.